In this last installment of a four-part series we'll find out what Hall of Fame trainer Richard Mandella has to say about racetrack surfaces, his philosophy of choosing jockeys and exercise riders, what he thinks of the stewards currently officiating the sport, and how racing has changed over the last 40 years. If you missed the series, go here for part one for an overview of his career, here for part two on the horse that put him on the map, and here for part three, where he discusses many aspects of his training philosophy. 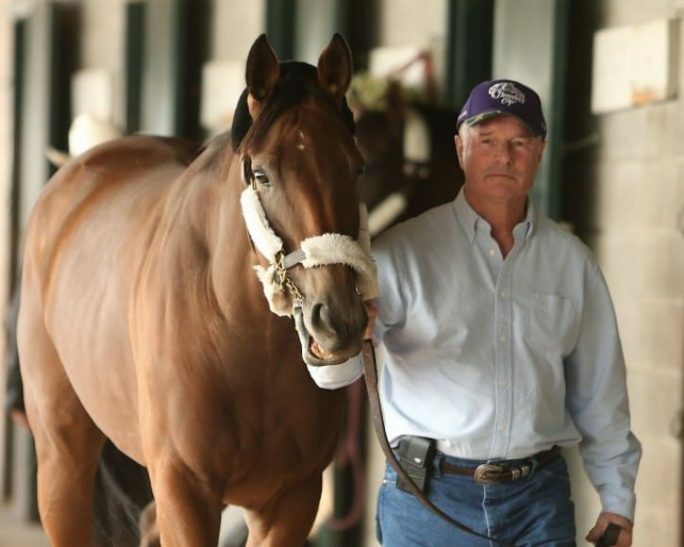 I caught up with Richard Mandella back at home base, his barn at Santa Anita. What about the physiology of the racetrack surface? The question being do you take into consideration where the race is being run and what that track is like before you enter a big race? It's your job as a trainer to have a pretty good idea of what kind of a track a horse will like or not like. Sometimes, more often than not, it's trial and error. Often you just don't know because you haven't had the opportunity to find out, but I don't pick tracks apart probably as much as others. I am of the belief that if the horses are all on the same racetrack you don't have that much to complain about. As trainers, you tend to blame the racetrack or the jockey. You come up with all kinds of things as to why they got hurt or why they got beat. I try not to get into too much of that because it is easy to fall into that pattern. How do you go about choosing jockeys? Dart board. I have several on a wheel and we throw it and wherever it sticks that's who gets picked. Yeah. Sometimes we spin it while we throw it. It mixes it up better. Ordinarily, I like to use a small number of riders – a few different good riders. There are riders that fit particular horses better than others. In California, as you know, we've always had great riders, and most great riders fit most horses. You don't have to work very hard at trying to fit a rider with a horse very often. A good rider is a good rider. I've never had a problem finding somebody I liked. Do you tend to give a lot of instructions to your riders or let them make the calls depending on how the race shakes out? But occasionally, because of the way a race lays out in the Form, just strategy wise, I'll say, “Hey, let this horse bounce out of there and get him right to the lead.” Again, I try to just tell a rider what the horse's tendency is in a race. If a horse is going long and he's got a lot of speed, I'll mention, “Hey, this horse will put you there easily, so you don't have to ask him leaving the gate. Just get him relaxed and comfortable.” “Comfortable” is a big word with me in regards to horses racing. Horses need to be comfortable in a race. What do you look for in choosing exercise riders? I look for how well they gallop a horse. Whether they're sober or not. Whether they show up on time. Those are all important parts. I'm laughing. So is Mandella and so is his wife, Randi, who sat in for part of the interview. I'm not afraid to use a heavier exercise rider for galloping, Obviously, I don't look for them to work horses too hard, but I've always liked having a heavier rider to gallop horses, as a mix. I think it's good for a horse to carry a little extra weight. And sometimes you want a boy with a little more strength to handle a horse. Let me ask you about the stewards. I'm going to preface your answer by saying Bobby Frankel – who I interviewed years ago – wanted to bring about change among the stewards and was not afraid to say he thought they were idiots. Bobby thought everybody was an idiot! The stewards aren't privileged. The last two jobs I would want on the racetrack are being a steward or being the track superintendent, because you can't win at either one. Horses are going to get hurt on God's gift of racetracks, occasionally, no matter how good they are. Just as any athletic endeavor is going to have injuries. The first thing you blame is the racetrack. That's why I would not want the job of track man. As for stewards, I've always enjoyed the thought of being on both sides of the call and trying to appreciate how it looks from either side. And it does look different on both sides of the call. If you're the one being taken down you look at it one way, and if you're the one fouled you see it your way. I do have a strong belief there should be a (former) jockey as one of the stewards. There should be at least one at every racetrack, because no one understands riding a horse like a jockey. I'm not saying every jockey is capable of doing that, but many are. It should be a requirement that there be a jockey in the stewards room to explain why horses do what they do. For example, if a horse shifts his weight to change leads and the steward sees that as the horse veering out, you have to make allowance for changing leads. There will always be good stewards and stewards that are a little lacking, throughout history and in the future. The call the stewards make will always be subject to criticism. I won't say they are worse than they ever were or better than they ever were. But as one recommendation, if I was asked of one, it would be to have a jockey as one of the three stewards. It's argumentative. Everybody says there should be more consistently with the stewards. If you ask 100 people you'll get that answer 95 times, but then if you ask them to explain “consistency” you'd have 95 different descriptions. My answer is that they should have scenarios that are similar. If you allow herding one time then you allow it every time. Meaning a horse coming five paths out, you disqualify him. If you do it, you do the next time too. Different scenarios should be consistent, but then each situation is probably different in their eyes. There should be circumstances that are similar that you could have a consistent way of ruling on it. You're being much more sympathetic and kinder regarding the stewards than some other trainers. I think I'm just being reasonable. Next time you're watching an inquiry, imagine yourself being the one taken down or the one being put up and see how your opinion changes. I've always experimented with that and find it interesting. Do you think the competition is tougher now? Is it harder to win races? Are there a lot of good trainers, not-so-good trainers? How does it compare to when you first came around? I could be like an old person and say nothing is like it used to be and it was better when I was younger. I hear a lot of old people saying that so I'm not going do it. I'm not going to be an old person. No, I think everything is the same. Actually, it is a different world. Now people want to get paid by the hour. Forty years ago people at the track got paid a set wage. You spent the time that the horse needed and you didn't watch a clock. It was better for the horses. You got paid by the month before, and you did what you needed to do. You really worked fewer hours and you hung around. People used to like to hang around the barn. You used to have to chase them out. Let's change subjects? What do you think of syndicates? Yes. What do you think of them? Worked pretty well in the crime business. And they say you have no sense of humor. I see absolutely nothing wrong with them. It has become a very expensive business and it's become a necessity to break up the expense into smaller portions. Syndicated ownerships allow more people to enjoy the sport of racing. Because my last major article was the Bobby Frankel interview and it's been over seven years since his death, I wanted to see if others felt the way I did, that racing lost something special with his passing. I asked Mandella if he felt the same way. Absolutely. It just doesn't seem like the same game, and it's not just him. You were around when (Charlie) Whittingham was walking around here. Laz Barrera, Bobby Frankel, Farrell and Gary Jones, Mike Mitchell, they each had their own individual identity. They were real characters of the game and irreplaceable. I couldn't agree more. I galloped for Laz and I worked for Gary for about eight years and interviewed Farrell for a story, and although I wasn't an official “Charlie's Angel,” (one of Whittingham's exercise riders) I free-lanced for him. It must have been a fantastic feeling to compete with them. What was it like? When I started training in 1974, Bobby had a lot of starter allowance horses, and we used to have some great starter allowance series in those days. Horses that ran for $25,000, $30,000 and $50,000 – once a horse became eligible they were locked in there and were safe from being claimed. And there were long grass races, which I really love. In 1974, I used to look at Bobby and say to myself, I wish I had some nice starter allowance horses like that. Then when Bobby started getting a lot of stakes horses, I thought damn, I'd sure like to get a lot of stakes horses like Bobby's got. I was kind of following him up and always envied him and what he did and what he had, along with a lot of other people. Everyone always dreamed of being Whittingham, but you wouldn't dare dream that far. He was so successful. Bobby, as it turned out, was the same, but he was in a growing stage, ahead of me, obviously. Quite a ways ahead of me, but he was still in the growing stage, so I got to admire him and with time I could be like him and have what he had as we went up the ladder. And thank God I got up the ladder a little bit too. Have you met all your goals, or perhaps exceeded them? Way past what I thought. I just used to hope someday to have a shedrow of those brown and white webbings with an “M” on them with horses behind them that could have some kind of success. So I'm way past that. When we read about Richard Mandella's success we see so much more than just his achievements. We see what all those who saw him in the earliest stages of his career witnessed. It was his willingness to meticulously learn his craft by studying others that he deemed worthy of his attention. His humility. His honesty. His tireless energy. When we read about someone who has achieved so much we are observing what they have learned and how they learned it. As readers we are taken on the journey with that individual and we learn as well. Richard Mandella's story is unique. Every great trainer's story is unique. There are trainers every bit as successful as Mandella, or more so – on paper, statistically, monetarily. However, Richard Mandella is a shining example of what the sport of horseracing should be. Not one life is insignificant. Not one life is wasted. Not one career is cut short due to a lack of knowledge or an unwillingness to try. His compassion for and appreciation of those magnificent animals that we call horses, make up the unique foundation of Mandella's personal success. If we have learned nothing more than that, our journey with Mandella will have been time well spent and it will continue to influence our thinking long after this journey has ended and the last word is read. Beholder retired at six years old. If she had never run a jump, her sale price of $180,000 would have been a bargain for her breeding value alone. Only stallions of suitable caliber would have been able to get near her and her offspring would have been astronomically valuable. Many others would have retired her long ago for that purpose. 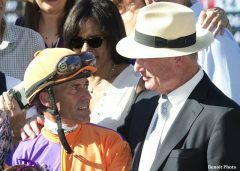 However, Mandella and Beholder's owner, B. Wayne Hughes, realized how important a horse like Beholder is to racing. The industry and her fans greatly appreciate that, as do those who write about this sport. To Richard Mandella and Mr. Hughes: Thank you, so much, for sharing the beautiful Beholder with us for as long as you did. And I'm sure I speak for all of Beholder's fans and American Pharaoh's fans when I ask; will there ever be a foal out of Beholder and sired by American Pharoah? 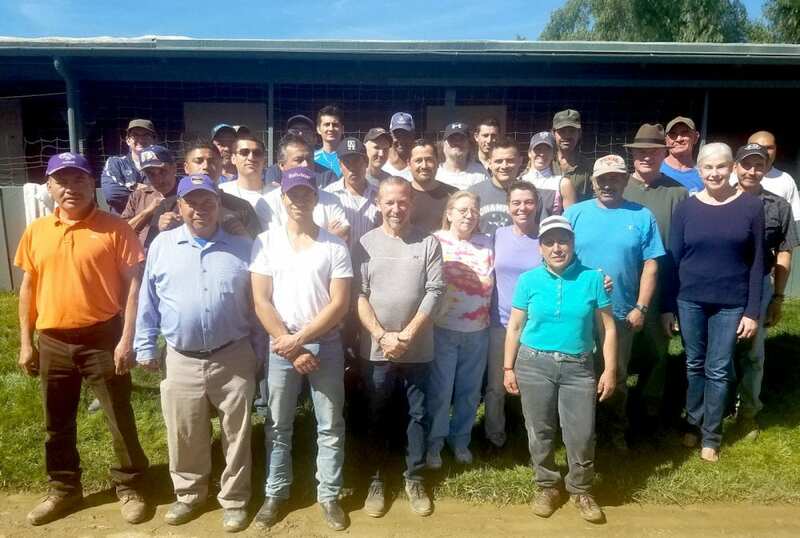 This entry was posted in NL Article, Ray's Paddock and tagged b. wayne hughes, beholder, bobby frankel, charles whittingham, farrell jones, Gary Jones, laz barrera, mike mitchell, richard mandella, Stewards, tere albanese by Tere Albanese. Bookmark the permalink.